I am a comics fan, and a librarian. I dipped my toe into the comics scene with trade paperbacks for years, but I didn’t really get into comics until I started grad school. I love reading, and between my full-time job and my classwork, I just didn’t have time to sit down and read anything more time consuming than a comic. It’s not unusual to find librarians today who say that they like comics. 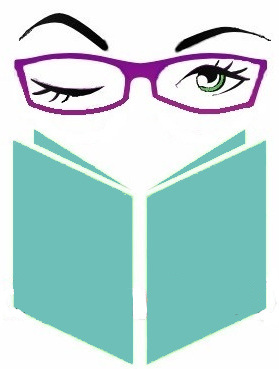 But here’s a dirty little secret about librarians: We pretend to read a LOT more than we really do. When deciding what to purchase, we read reviews and summaries and base our purchase decisions on that. Even in libraries, no one is reading this trash. Many librarians seem to think that enjoying one Alan Moore trade paperback and liking comics are the same thing. They are not. Most librarians who say they love comics, have read a handful of “graphic novels” and weirdly resist calling them “comics” (yet they call comic artists “cartoonists”) I’ve never understood that. Comic book sales are down across the board due to a number of factors. The downfall of comics over the last few years is not the fault of libraries, but we aren’t helping, allow me to explain. The fact is, we librarians like to trick ourselves into thinking that we are the center of a wonderful Utopian ideal, that libraries are all about preserving knowledge for future generations, holding up unpopular ideas and fighting for the rights of our patrons to think for themselves! . . . unless they disagree with us. This argument appealed to people who wanted to believe that their kids misbehaving had nothing to do with bad parenting. After all, if bad behavior is due to complex sociological and psychological reasons, then we as parents and society have to change, and that’s hard. Let’s just blame the nerds, we never liked them anyway. Thankfully, we don’t do that kind of blame shifting for today’s problems. Outrage about comics grew, and soon there was a government investigation into the effect comics had on readers. Seeing themselves being cast as the super villains of culture, the industry developed the Comics Code Authority, which set strict editorial guidelines for what could and could not be depicted in comics. By the late 1980’s the blame for youth’s problems shifted to rock music and video games, and eventually, the code just disappeared. Since comics were so looked down on for so long, comics went “underground” they were part of the counter-culture of the 1960’s and tried to deal with current issues like racism, and drugs. Then Alan Moore showed up. Watchmen changed everything! Watchmen made the list of the New York Times All Time 100 Best Novels and The Killing Joke proved it was not a fluke. Comics could be art. One of the big changes in the library world in recent years is the idea that you can read for enjoyment, and not just to research information. Yeah, after centuries of the “three-part novel” librarians are just NOW getting this! Libraries have finally started investing in their fiction collections and at long last, comics. As a result, comics place in the counterculture died. Think like a teenager for a minute here: if you like comics, and suddenly your school librarian says it’s fun to read comics, that doesn’t make your librarian cool, that makes comics lame. I say this as a high school librarian: I will never be cool! Earlier I talked about librarians not reading the books they buy. Now, it’s true that we librarians can’t always read a book before we buy it. We are responsible for too many books to read each and every one of them. This means that librarians rely on book reviews in professional journals. That’s all well and good for more established genres, but not for comics. Many professional library journals reviewers are not comics fans, and they can’t judge these things as a fan would. They may try, but they simply don’t know what they are talking about. Comics like Watchmen work as self-contained stories while ongoing story arcs like your average volume of Spider-Man is an ongoing story, covering multiple volumes and often relies on the reader knowing continuity. A first-time reader reviewing this kind of story has a hard time following plot, let alone knowing if the story is good or bad. Case in point: the silver era. The silver era so corny and off the wall, I love it! Wonder Woman-owned a Mod clothing store, no one cared that Batman kept a twelve-year-old boy in a cave, and Superman dated a mermaid! Alan Moore’s “Whatever Happened To The Man of Tomorrow” is the silver era’s swan song. If you try to read this comic today, without any knowledge of what the silver era was like, you will probably hate this comic. but when you understand what the silver era was, and the way this comic quietly closes the door on the chapter of Superman’s mythos, it’s a great story. but most modern reviewers, would likely not catch that. You can’t review something if you don’t understand it. Some librarians recognize this problem and turn to comic book review sites, but that leads to more problems. Some comics writers today got their start writing comic book reviews before moving into the industry. Reviewing comics is now seen by some aspiring authors as a way to get their foot in the door of the industry. So it’s hard to tell if the reviewer you are reading is being genuine with their opinions, or just trying to butter someone up for a job. Far too many librarians still think of comics as cartoons. Yet they see how popular they are in the theaters, so they buy comics not based on what comics fans want to read, but on what they think 10-year-olds would like. Many librarians, especially YA librarians, also blog about comics, this generates a false market of comic “fans” that many publishers are trying to appeal to. So a bunch of librarians who don’t really read comics, but want to sound cool and hip to the kids these days, are blogging about comics. 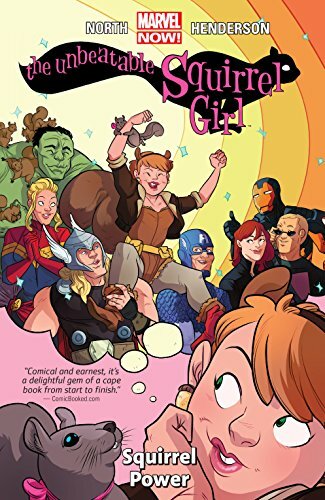 In most libraries, graphic novels fall under the purchasing budget of the YA librarian, and so author name recognition comes into play, hence why established YA authors like Rainbow Rowell and G. Willow Wilson get their comics into public and school libraries and the many comic’s authors like Peter Tomasi, don’t. Of course, those of us who actually READ comics know the YA authors tend to make bad comic writers. What works in a novel, just doesn’t in a comic. You can have a story about a couple of kids freeing lab animals from an unethical research lab in a YA novel, but when that’s your basis for a Wolverine/Deadpool team up you fail comics! So is that it? Is that the only way libraries have hurt the comics industry by inflating sales of bad comics because the buyers don’t know any better? No, the real problem is the activist librarians. Historically speaking, English literature has been very Euro-centric. For hundreds of years, only British white guys were “the greats.” Modern librarians- with the best of intentions- have sought out a more diverse range of authors. The problem is that many librarians are willing to sacrifice quality in order to fill the shelves. They assume that comics have suffered the same white-washing history as the rest of literary culture when it’s actually been one of the most progressive forms of media. Many YA librarians think that putting a Ms. Marvel comic into a kid’s hand will make them more accepting of Islamic culture. Of course, when the kids see Ms. Marvel illegally detaining America citizens, indefinitely, for thought crimes, without a trial, (yes, that happened) I would think this plan would backfire. Librarians love to think we are holding up unpopular ideas in the face of opposition, but that’s not what is happening in comics. Bobby Drake is one of the original X-men. Readers have seen him in multiple romantic relationships with women. In a mini-series, Bobby’s old girlfriend, Opal, tells Bobby that they have a son. The comic revolves around Bobby having to save his son from being a human guinea pig while he wrestles with leaving the X-men to focus on being a father and trying to rekindle things with Opal. Opal apologies and says tells Bobby that they are leaving the country and he will never have to see them again. I’ve heard of people hiding from themselves that they are gay, but COME ON! If Opal is Bobby’s subconscious beard, the whole relationship drastically changes and is cheaper as a result! And this was just one example from a four issue mini-series! Now add 50 years of continuity, and you have some idea how fans feel. Now we are told that, Bobby is 100%, totally, fabulously, Will & Grace style, gay. This is such an insulting steroype, and a radical change from the character we knew that it’s jarring. It’s not that Bobby is gay, it’s that this person isn’t Bobby! 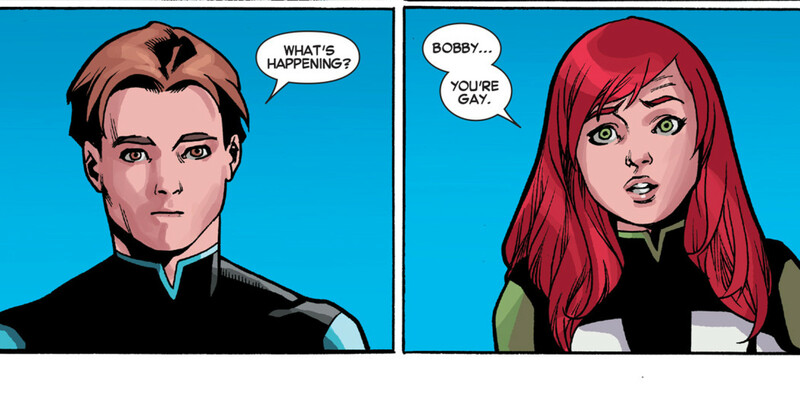 Note that Marvel did not announce that Bobby was bi-sexual and crafted a story where Bobby decided to explore the repressed side of his sexuality. Over time Bobby could discover that he preferred relationships with men. That would have been a way to handle this story with an organic change to Bobby’s character that fans could have excepted. That’s the problem, this was not written for comic fans. This was written to virtue signal that one of the original X-Men was gay, not because it was an organic character arc for Bobby. The way Bobby ‘discovered’ that he was gay was just insulting! Jean reads his mind and she tells him he is gay. Keep in mind that Jean is a powerful telepath who can mess with people’s minds. Fans didn’t come away saying “Wow, Bobby has been repressing his true self this whole time.” They came way saying “Jean broke Bobby’s head!” Apparently in the world of Marvel, being gay IS a mental illness. Comics culture has always been a silly, geeky, sub-culture. Doubt me? Imagine explaining the origin of Superman to someone who has never heard of the character before. It’s really silly when you think about it. Planets don’t just blow up! (You don’t get the ret-con that Bendis!) Why didn’t his parents build the ship large enough for the whole family? Why does an alien look human? How does solar radiation give him superpowers? Why is his only weakness a chunk of his home planet? Before my fellow nerds freak out, I know the in-universe explanations. That’s not my point here! 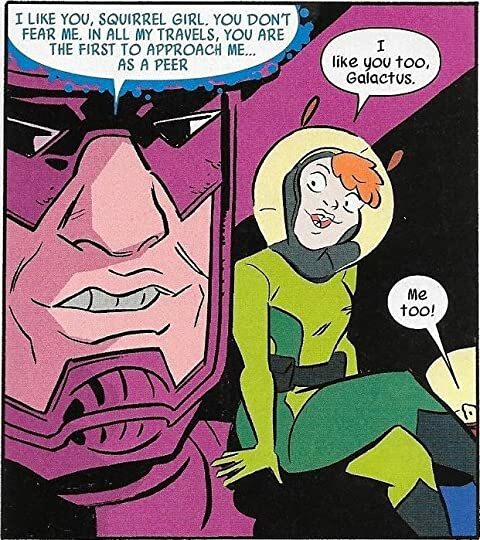 My point is this: Comics are confusing and weird, and fun! That’s the whole point of comics! 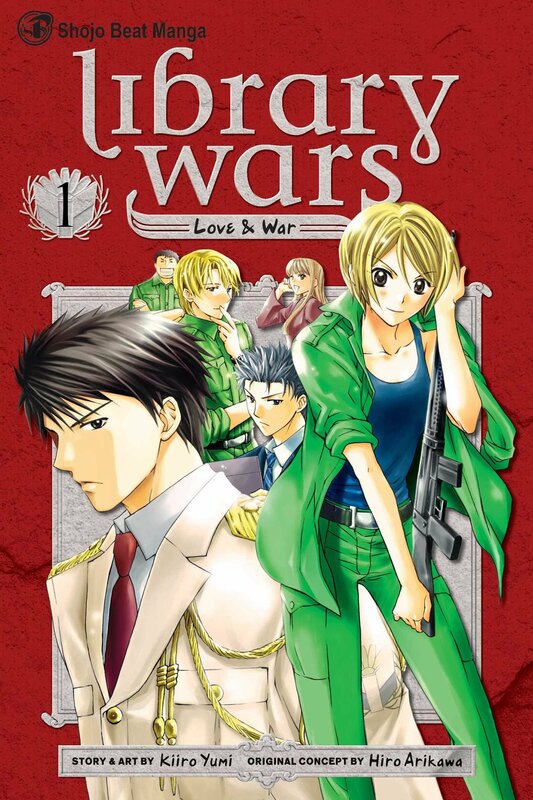 There is a manga series that I love called Library Wars. The idea is that the government censors everything, except for the libraries. Librarians literally have to fight for intellectual freedom in the face of censorship. This is the world we librarians imagine ourselves in all the time. Intellectual freedom is why I became a librarian in the first place. In a world where people in the UK are put in jail just for teaching their dog to do a stupid trick, Intellectual freedom is more important – and harder to find – than ever before. I was in graduate school when Trump was elected. The day after the election, my professor walked into class saying Trump was going to close down the libraries, and he told the female students to “get your abortions now.” I’m not one to get triggered, but I had to walk out of the room to compose myself. For this professor to make such a statement and assume that everyone in the class felt the same way was not only exclusionary but the way he expressed it was unprofessional and sexist. This man was going to teach us about inclusivity, and intellectual freedom?! As long as librarians see it as their role to tell others what they should and should not think, we will see librarians being a part of the destruction of comics culture, but this does not have to happen. Libraries can be a voice for the underdog, my fellow librarians, we CAN give voice to those who can’t get their unpopular ideas heard. If, for once, we libraries can stand up to cultural pressure and actually take our Bill of Rights seriously for once we can all hang together for true freedom. . .
… Or we can all hang separately. “Library Bill of Rights.” Advocacy, Legislation & Issues, American Library Association, 16 Feb. 2017, http://www.ala.org/advocacy/intfreedom/librarybill. Misiroglu, Gina, et al. “Superhero.” Encyclopædia Britannica, Encyclopædia Britannica, Inc., 1 Feb. 2017, http://www.britannica.com/art/superhero#ref1241641. Knott, Cheryl, “University of Massachusetts Press.” Not Free, Not for All, UMass Press, Jan. 2016, http://www.umass.edu/umpress/title/not-free-not-all.